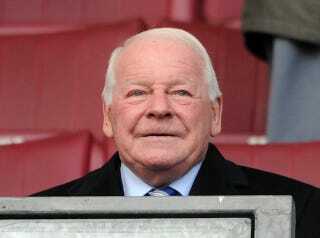 Dave Whelan, the septuagenarian owner of former Premier League club Wigan, is having some trouble keeping his foot out of his mouth. Of course, when words like "chink," "chingaling," and phrases like "Jewish people chase money more than everybody else" seem like acceptable fodder for public statements, it's understandable that the old man can't help but idly gum on those toes of his. May you never have to be defended by Harry Redknapp. Asked whether he did not think what Mackay said was offensive, because the claim that Jews "love money" has been used as a negative stereotype, Whelan said: "Do you think Jewish people chase money a little bit more than we do? I think they are very shrewd people." Asked if he himself believed that, Whelan, the multimillionaire former owner of JJB Sports, said yes: "I think Jewish people do chase money more than everybody else. I don't think that's offensive at all." [H]e said the word "chink" is not offensive, and that he used to say it of Chinese people when he was young. "If any Englishman said he has never called a Chinaman a chink he is lying," Whelan said. "There is nothing bad about doing that. It is like calling the British Brits, or the Irish paddies." "I apologise profusely to anyone who has taken offence because I would never offend the Jewish community under any circumstances. I have nothing but respect for them. They're hard-working people, they're honest people. They fight for what they believe in. "There's nobody could knock the Jewish community. For them to accuse me of that, it hurts me a lot. Never have I made anti-Jewish comments. "We have always, always respected what the Jewish people did, especially through the war. We've always respected how those Jewish [people] stood up to every single thing they were put through, torture, horrendous." Whelan stressed to the Jewish Telegraph he has many Jewish friends. He said: "I wouldn't like to mention any one of them. "Please take it I have a lot of Jewish friends. "I bet there are a dozen who have got apartments in Majorca, where I am. "And so many Jewish people go to Barbados at Christmas. That's when I go. I see a lot of them in the Lone Star, in restaurants. I play golf with a few of them. "I don't want to mention any particular names because I don't want to pull their names into it. "It would be unfair of me because they are good friends. They may object to me putting them in a newspaper or in publicity or whatever." "When I was growing up we used to call the Chinese 'chingalings'. We weren't being disrespected [sic]. We used to say: 'We're going to eat in chingalings.' The Chinese weren't offended by that. That was the name everyone in Wigan called it [the first Chinese cafe in Wigan]." Just because you've gotten used to the taste of it by now doesn't mean you aren't still sucking on that foot, Dave.